PJ's has long been a neighborhood hangout on North Monroe Street. Pausing as she hauls in a load of groceries, Meadow Frank runs down to her office to bring out a tan photo album with a gold border on the cover. "There's a ton of old pictures in here from back in the day," she says, pushing it across the bar top before whisking out the back door to load in more from that afternoon's Costco run. Indeed, the pages are filled with scenes of feather-haired women and bearded men lounging on red upholstered couches, smoking and drinking and posing with shiny pool league trophies in the same building (constructed in 1921) that's housed the Monroe Street hangout for decades. Operating as PJ's Pub for more than 20 of those years, not much has changed since those good times of the 1970s. Back then, it was called the Red Robin Tavern. Then-owner Dorothy Curtin confirms the story that the national Red Robin burger chain paid for the rights to use the moniker. Then it became just "The Robin," later The Rhino, and finally PJ's, after two other prior owners named Pete and Jim. The scent of cigarettes from the smoking days clings to the walls, and the pool tables are still there, upstairs above the bar. There's a remodeled patio with a fish pond out back, but the bathrooms are still very much stuck in the olive-green theme of another era. Frank is saving up to redo them next. When Curtin owned the business back in the mid-'70s with her ex-husband — those are her photos in the album — there were several ceiling murals painted by a local artist. "It took five different people to tell me this before I believed the story that there was a mural above the bar of the Starship Enterprise, surrounded by paintings of regulars looking down around it. I thought people were lying to me for years," says Frank. What hasn't changed at PJ's in all that time is the welcoming, laid-back feeling and the sense that no matter your station in life, the pub's regulars and staff accept all who enter as friends and equals. It's this "I've got your back" mentality that's remained with Frank since they day she walked in. Her first shift waiting tables at PJ's was May 4, 2004. She bought the bar two years ago when the only other option was for it to close, which meant everyone on staff — including her — would lose their jobs. Since taking over, Frank has used the venue as a platform to help out anyone in need. Over the past two years she's organized numerous fundraisers, raising thousands to help bar regulars, friends and local families facing unexpected hardships: illness, job or housing loss, the death of a family member. She recalls being in those tight situations herself, raising her now-nearly-21-year-old son as a single mom. He was born when she was only 14. "I'm very passionate about helping people, and this is a good platform for that," Frank says. "We band together to help a lot of people." 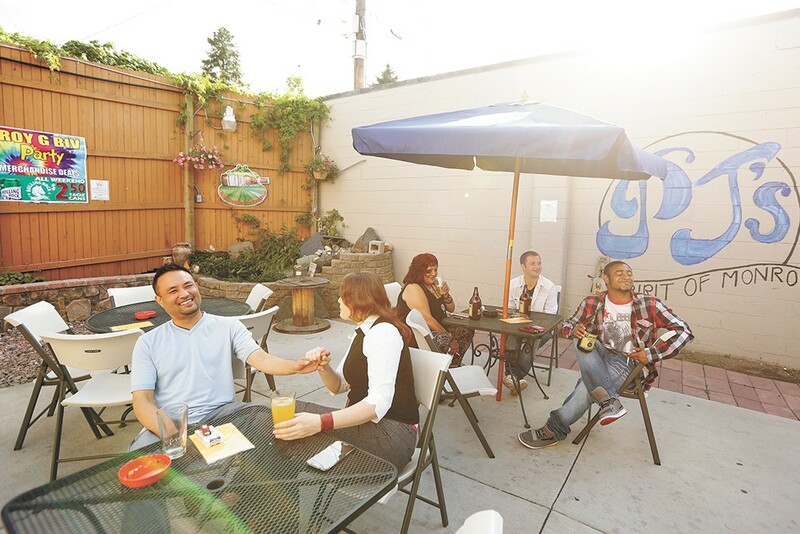 While PJ's is located on the edge of Spokane's West Central neighborhood, people come from across town to spend a night there in good company. Besides the regular bar offerings of beer, shots and mixed drinks, PJ's serves up a full pub food menu, with brunch during the week until 5 pm and breakfast on the weekends from 11 am to 4 pm.